The Niederseidewitz Agricultural Cooperative in Bahretal (Germany) has been using a Triotrac self-propelled mixer feeder for their feeding for nearly ten years now. Niederseidewitz's first self-propelled Triotrac was recently retired after 9.5 years of faithful service, having clocked 20,797 working hours! Niederseidewitz was the very first customer for the first generation Triotrac. On 14 February 2008, the 20 cubic metre self-propelled machine was put into service at this dairy farm consisting of 1080 milking cows and another 900 young stock and has performed perfectly ever since. 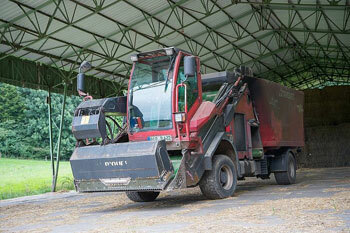 Twelve loads are made each day, processing an impressive 50 tonnes of feed per day (18,250 tonnes annually). After 9.5 years, the time has come to replace the self-propelled mixer feeder. Once again, a Triotrac was chosen, a completely updated version this time. Not a difficult decision according to owner Dr Fleischer and regular driver Lutz Freudenberg, who worked with the Triotrac for all those 21,000 hours. Over the past ten years, various parts have been replaced, from augers and the cutting unit to the entire mixing vessel. "The self-propelled mixer feeder has to run 365 days a year, five hours a day, and is never stationary longer than half a day, no wonder the machine requires maintenance. We do the smaller jobs ourselves, such as filter replacements and oil changes, but major maintenance is done by our dealer. We also receive excellent support from Trioliet themselves. Are there any disadvantages? “Sure, we would prefer a lower purchase price, that's the only negative," laughs Fleischer. Company name: Farming cooperative Agrargenossenschaft Niederseidewitz e.G.